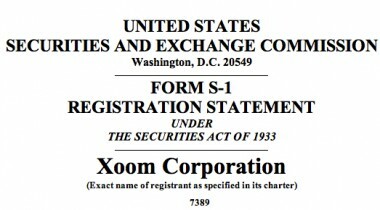 After months of speculation, Xoom has finally filed to go public. On Friday, the online money transfer company filed its S-1 with the U.S. Securities and Exchange Commission, announcing plans to list its shares on Nasdaq under the ticker “XOOM” in an IPO to be made through Barclays, Needham & Company, Raymond James and Baird. The raise in the initial public offering for now? It’s $50 million. That could change; as yet, there is no valuation listed in the S-1. A big step for Xoom and its investors — which include venture capital firms Sequoia Capital, New Enterprise Associates and Agilus Ventures — but one for which the San Francisco-based company seems well poised. Its revenue grew 68 percent in the first nine months of 2012, to $57.8 million. And it estimates revenue to be in the range of $21.9 million to $22.4 million for the three months ended December 31, 2012 — a nice bump over the $15.6 million it generated during the same period in 2011.